Saint Luke, patron of the Army Medical Service. The Army Medical Service (SSA) was founded in 1708 by an edict of Louis XIV. Since then it has continued to develop and adapt to new constraints of combat while integrating the most advanced technology. Because he was a doctor, the evangelist Saint Luke was chosen as the patron saint of doctors in the Middle Ages. 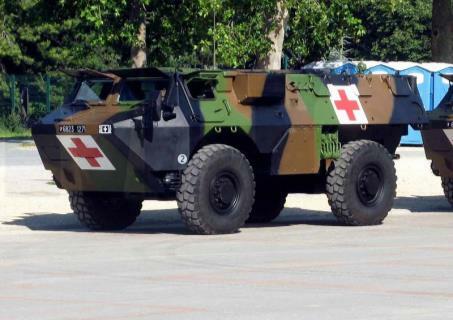 Traditionally, 18 October is Army Medical Service Day, when the armies meet for events based around the common values of "Dedication, Humanity, Availability"
The VAB SAN (Medical Armoured Advance Vehicle) has proved successful in emergency aid missions for those wounded on operations. Identifiable by the large red crosses on a white background, it is equipped in the same way as an ambulance and can carry up to three injured persons lying down, or 2 lying down and 4 seated. Book: Alain Larcan, Jean-Jacques Ferrandis, The Army Medical Service during the First World War, LBM, 2008.